Fall River, MA - The 2017 Specialty Graphic Imaging Association (SGIA) Expo brought together leaders of the specialty imaging industry this year in New Orleans, LA. In addition to a successful showcase, Displays2go, Fall River, Mass. 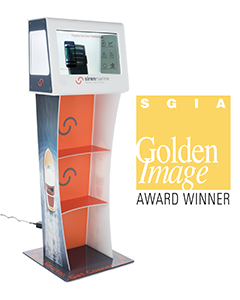 was recognized in the Association's prestigious Golden Image Competition with a Gold Award for their collaboration with Siren Marine; “Siren Makes a Splash with SplashBox” in Category 20: Retail/POP Displays/Exhibits, Subgroup: Digital Entries. More than 60 companies from around the world entered the competition, submitting nearly 300 entries in 53 product categories. Conducted during the 2017 SGIA Expo (New Orleans, LA, October 10-12), this year’s event was one of the most challenging in recent history. “Winning the Gold Award for Retail/POP Displays/Exhibits; Digital Entries puts Displays2go among the top specialty printers in the world in terms of quality and capability. The ability to consistently print such high-quality products indicates that Displays2go is an expert at controlling the many variables involved in specialty printing,” Shell said. A recap of the 2017 SGIA Expo - including the complete list of Golden Image winners - is available online at SGIA.org. About Displays2go: Displays2go, a subsidiary of TAKKT AG, is the leading e-commerce retailer of point-of-sale marketing displays and trade show supplies in America. The company is known for its large selection of products designed to empower people and brands with personalized solutions. SGIA - Supporting the Leaders of the Digital & Screen Printing Community “Specialty imaging” comprises digital imaging, screen printing and the many other imaging technologies SGIA members use, including those they’ll tap in the future. These are the imaging processes and technologies employed to create new products and to enhance existing products including point-of-purchase displays, printed electronics, membrane switches, signs, advertisements, garments, containers and vehicles. Make the most of your specialty imaging business. SGIA press releases and artwork are available at SGIA.org.